Irene Becker and Richard Hauser "Bringing Income Distribution in From The Cold" was the title Anthony B. Atkinson gave his Presidential Address to the Royal Economic Society in 1996. This provocative formulation was intended to draw attention to the way in which the subject of income distribution long has been marginalised in the field of economics (Atkinson 1997). In recent years, however, scientific interest in matters of personal income distribution has been growing. One reason for this recent concern stems from the political sphere: The factors of reinforced competition between countries due to the globalisation of markets and European integration, high unemployment rates and demographic changes necessitate reforms of labour markets, tax systems and social security systems. These reforms will affect both allocation and distribution, so that reliable information on both areas is needed to devise balanced political programs. 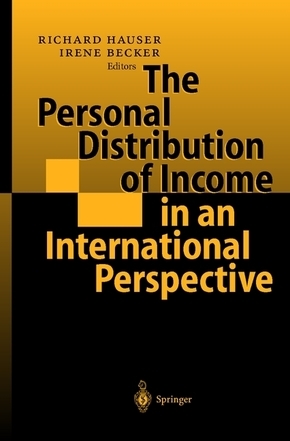 Another reason for the burgeoning literature on personal income distribution is the improved availability of data on individual income, which are a major prerequisite for detailed analyses of distribution topics. Last but not least, the development of powerful computers, advanced statistics, econometric packages and extended micro-simulation models enables researchers both to work with huge individual data sets to describe and explain the personal distribution of income and to simulate the effects of political (social and economic) programs. The volume at hand is based on some of the research advances in this field during the last decade. I. Becker, R. Hauser: Introduction.- V. Steiner, T. Hölzle: The Development of Wages in Germany in the 1990s - Descriptions and Explanations.- H. Fabig: Labor Income Mobility - Germany, the USA and Great Britain Compared.- A. B. Atkinson: The Distribution of Personal Income: Complex Yet Over-Simplified.- R. Hauser, I. Becker: Changes in the Distribution of Pre-government and Post-government Income in Germany 1973 - 1993.- J. Merz: The Distribution of Income of Self-employed, Entrepreneurs and Professions as Revealed from Micro Income Tax Statistics in Germany.- S. Jenkins: Trends in the UK Income Distribution.- I. Eriksson, T. Pettersson: Income Distribution and Income Mobility - Recent Trends in Sweden.- J. Frick, F. Büchel, P. Krause: Public Transfers, Income Distribution, and Poverty in Germany and in the United States.- T. Smeeding: Changing Income Inequality in OECD Countries: Updated Results from the Luxembourg Income Study (LIS).- J. Schwarze, J. R. Frick: Old Age Pension Systems and Income Distribution Among the Elderly: Germany and the United States Compared. Irene Becker arbeitet seit über einem Jahrzehnt selbstständig als Management-Beraterin für Großunternehmen. Sie führt regelmäßig Seminare und Coachings zum Thema durch. Richard Hauser ist Professor der Volkswirtschaftslehre an der Johann Wolfgang Goethe-Universität in Frankfurt/Main.